When someone tells me that this year’s Book Expo America will be the first he or she has ever attended, I’m a little envious. Walking into the exhibit hall for the first time is quite an experience. I remember my first show, as a bookseller. It sounds funny now, having been to many BEAs since then, but to me the sheer number of people, books, and attendees was nothing short of awe-inspiring. And of course there was all the excitement of the parties, spotting famous authors, and checking out the myriad galleys and giveaways. 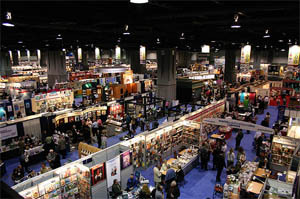 My main task at that show, a worthy one, was to scout out new titles from small and/or independent publishers our store didn’t necessarily do business with on a regular basis. In other words, I was on a treasure hunt, looking for the hidden “gems” that would set our store’s selection apart from the others. I probably won’t surprise anyone when I say that I didn’t accomplish as much as I’d planned, even though I was in attendance all three days of the show. Obviously, now that I’m working on the publishing side of the industry, my BEA experiences tend to be a bit different. For me, BEA now marks the official start of the fall selling season. I usually see a couple of accounts before Memorial Day, but my work begins in earnest in early June, after the show has ended. Appropriately, then, BEA affords a welcome opportunity not only to tell booksellers about our new fall releases, but also to meet old friends, make new ones, and maybe even go to a couple of parties before it’s time to hit the road and start selling. I should mention that BEA is also a good time for us publishers to show booksellers that we appreciate them. This year we held a drawing for a free stay in Cambridge’s apartment, located on the Upper West side, for the duration of the show. The winners of our drawing are Kepler’s Books and Magazines (Menlo Park, CA) and the Brown University Bookstore (Providence, RI). See you at booth # 4146!